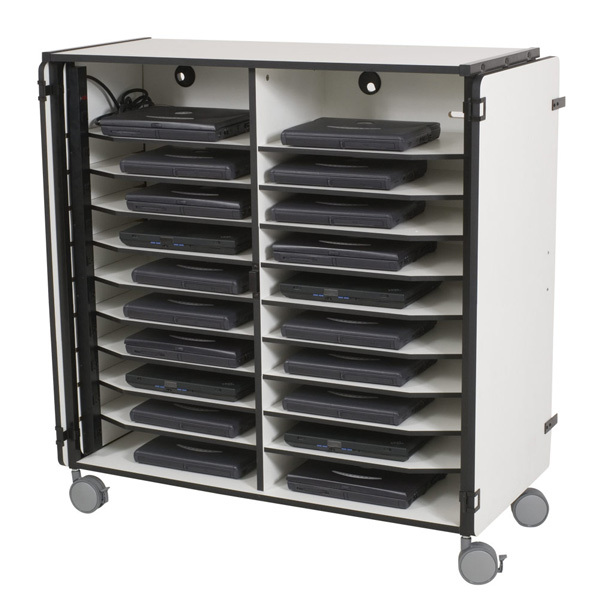 The 20 Slot Mobile Laptop Cart 27541 Charging Station by Balt features 20 shelves to hold your school's Dell, HP, Apple laptop or netbooks. 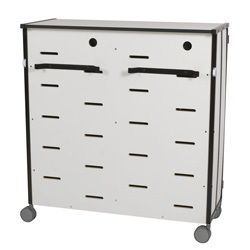 Constructed from high pressure laminate in light gray with a powder-coated black steel frame. Each shelf is 21.75"W x 14.75"D x 3.25"H, and has two UL/CSA approved electrical outlet on a power strip that runs down the left and right side of the laptop cart for charging. Back corner of each shelf is designed for wire management and ventilation. 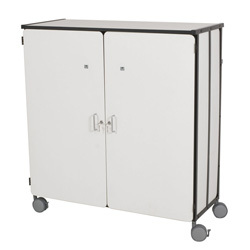 Doors swivel 270 degrees and fold flat against the cabinet, held in place by a magnet for easy loading and unloading. Rolls easily from room to room and building to building on large, 4" swivel casters, two locking.